Size: 10mm. 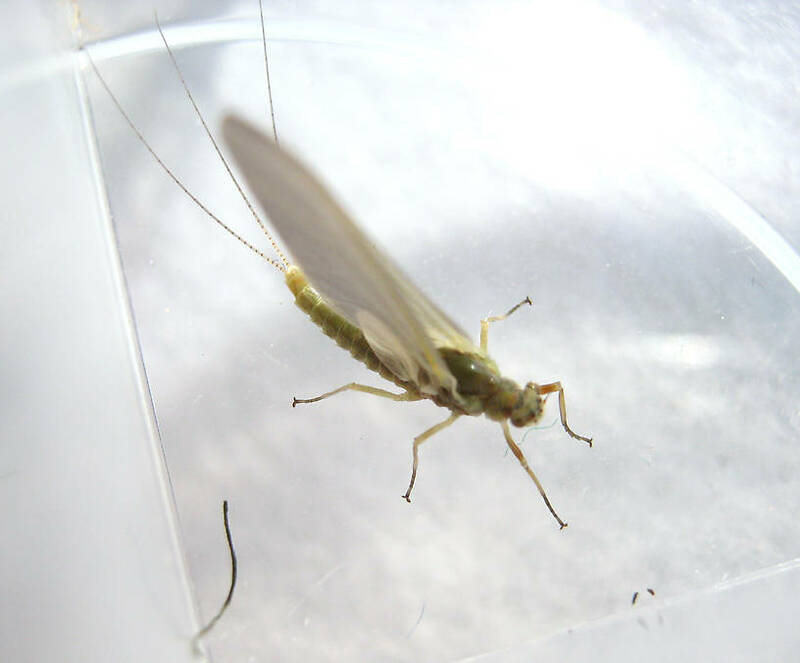 At emergence the specimen was a fairly bright olive green and there was obvious difference in color between the forewing (med. dun) and the hind-wing (pale cream). It was really noticeable as they floated by. You can just make these features out in the second photo, but not so much in the first that was taken 24 hours after capture. Total time from emergence to molting - approx. 48 hours. Edit 2/25/13 - This specimen was originally posted to E. d. infrequens because of its size. It turns out large size doesn't hold up as a way to tell these two apart. This is because excrucians has much greater variability than previously understood. The assumption by anglers that excrucians is always the smaller of the two is apparently not supported by science. There is a lot left to sort out with western Ephemerella species. This may include new discoveries and/or synonyms (Synonym: A former name of a taxon, usually a species. Entomologists frequently discover that two insects originally described as different species are one in the same, and they drop one of the names. The dropped name is said to be a synonym of the remaining name. These changes take a while to trickle into the common knowledge of anglers; for example, Baetis vagans is now a synonym of Baetis tricaudatus.) as well as reportage on new intraspecific variations broadening the descriptions of recognized species. Based on this specimen's Fall maturity, the best guess is that it is an unusual form of excrucians. 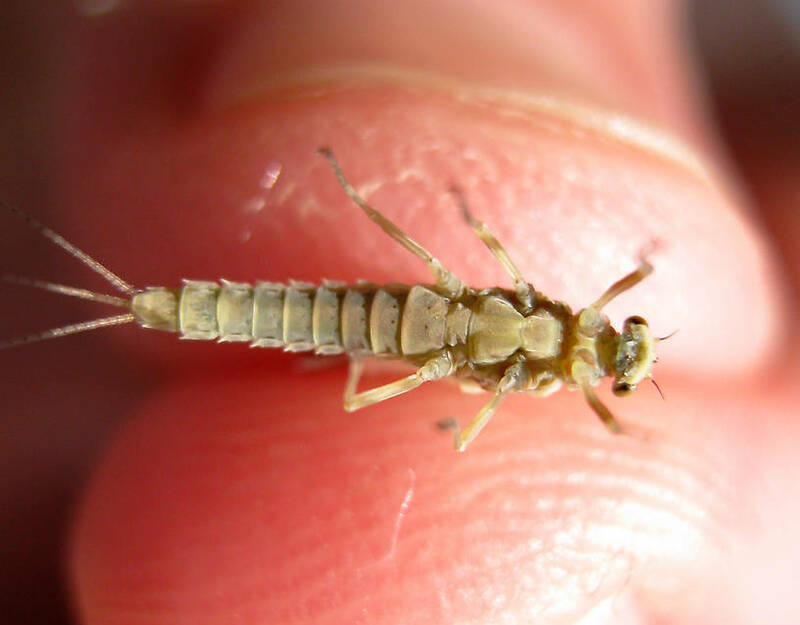 As to color, both species duns (nymphs too) demonstrate a tremendous amount of intraspecific variability from pale yellow to bright green with a multitude of sulfur shadings in between, ranging from pale amber, through orange to cinnamon and even dark brown. I've seen wings from pale cream through tannish and almost every shade of dun except the dark shades. Some have pigment stained leading edges matching their bodies, some don't. Most of these variations are undocumented except in angler references and periodicals. It seems a rare year that a new variation doesn't pop up to the notice of anglers. Bottom line - size is only reliable if the specimens are smaller than size 16, pointing to excrucians. Otherwise, the only fairly dependable way to tell them apart (especially the females) is by timing as infrequens is the first of the two to appear, rarely lasting longer than a couple of weeks or later than the end of June most years. The problem with using timing for determination is it requires knowledge of the hatch sequences as they actually occurred for a given year on a given piece of water. Obviously, this kind of information is seldom available. Without it, determining between the two duns if they are larger than size 18 is speculative at best - at least until very late in the Summer. 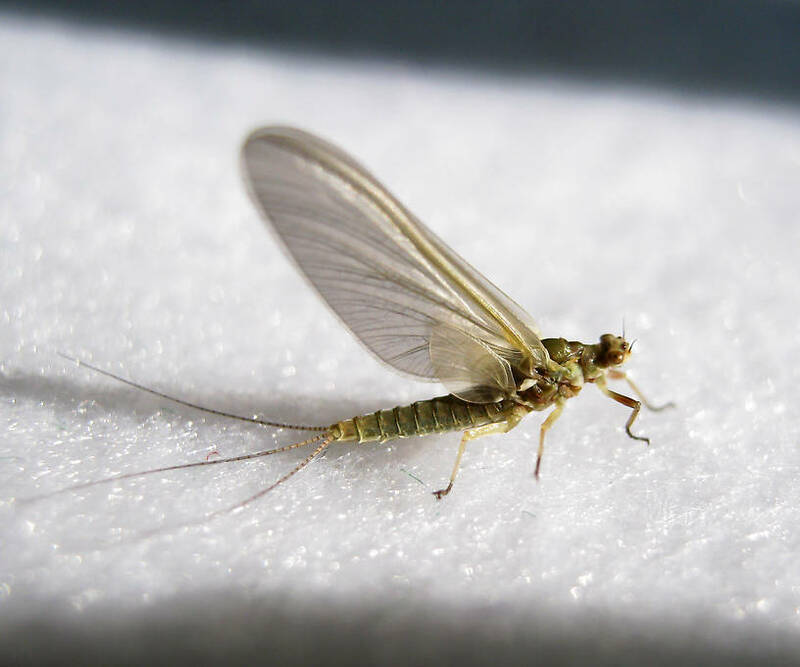 This mayfly was collected from the Fall River on October 16th, 2011 and added to Troutnut.com on October 21st, 2011.